There appears to be no end to the SUV sales boom that has gripped the auto industry for more than a decade, with almost all size categories surging ahead of 2017’s totals. And it doesn’t seem to matter which end of the scale you might be looking at, everything remains on the up and up, though it’s the medium category that’s by far the most popular. It’s also as difficult as ever to choose between make, model and variant, given the sheer number of SUV manufacturers involved – around 31 in total, and of those there are at least seven carmakers battling it out amongst premium SUVs with a price tag of 40-grand or more. They’re not all the same size, though, ranging from the visually diminutive Audi Q2 to the slightly larger BMW X1, Jaguar E-Pace and upcoming Volvo XC40 – all of them classed as small SUVs. There are others too, like the aging Audi Q3, all-new BMW X2, Infinity Q30/QX30, Mini Countryman and of course the Range Rover Evoque. So even in this relatively niche segment, the choice is still wide and varied, with each offering its own take on the pint-size luxury SUV formula. But what if you’re like me, faced with a real-life choice in the matter after being easily lured by the posh Euro badge over more sensibly priced options? Nothing new, really, we’ve been caught in that trap for decades – living on the breadline but always a nice ride in the garage. We’re still loving our high-priced, optioned-up Land Rover Discovery Sport after three trouble-free years and nearly 100,000km on the clock. We bought the seven-seater version thinking it would be easier to offload eventually, but truth be told, we haven’t used the third row all but twice, which brings us to this decision-making point. It’s time to downsize, after being left with just one kid at home and two years of high school to go. But she’s a big kid. Not wide, mind you, but at 177cm tall with ski poles for legs and arms just as long, decent rear leg room is imperative – especially given how much time she spends back there while being driven to sporting events and those countless training sessions. While both Audi and BMW offer diesel versions of their smallest SUVs, we’ve gone for the lighter turbo-petrol models given diesels appear to be on the nose, and the fact both are relative lightweights claiming excellent fuel economy. We’ve also opted for the range-topping variants of each model, figuring if you’re going to go small and save a few bucks by dropping a size or two, you may as well get all the latest kit, comfort and performance on offer in this segment. Certainly, that’s what this reviewer’s family is looking at after climbing out of an HSE Luxury-spec SD4 Disco Sport with a list price of nearly 80,000 bucks. And, top spec or not, there are still substantial savings to be made on the floor price, let alone monthly lease payments. That’s especially true of the Q2, which is listed at $49,100 plus on-roads. But our tester is loaded to the hilt with optional extras like the Assistance Package, S Line exterior package, and the Technik Package that adds everything from Audi’s much lauded 12.3-inch digital instrument display to sporty styling bits, as well as a suite of the latest active safety systems, too. Its final sticker price – $59,740. Still, that’s a lot less than $80K. Naturally, there’s stuff like dual-zone climate control, park assist (helps steer the car into parking spots if it looks a bit too tight), front and rear parking sensors with rear-view camera, LED headlamps and tail-lights (the latter with dynamic indicators – such a cool feature) and Apple CarPlay and Android Auto via USB connection. Our range-topping BMW X1 is similarly priced at $60,700, without options, but adds a pricey metallic paint job (Mediterranean Blue) and a panoramic glass roof that takes it up to $63,680. However, it also gets its fair share of creature comforts and up-to-date tech as standard inventory. The list includes features such as auto tailgate, head-up display, Comfort Access, Driving Assistant, LED headlights, Navigation System Plus, Performance Control and DAB digital radio. Standard wheels on our X1 xDrive25i model are 19-inch light alloys shod with BMW’s typical run-flat tyres, which negates the need for a spare tyre. If you get a flat, no problem, you can still drive on the tyre (at a reduced speed) all weekend, if you must. Our Audi Q2 also came with fancy 19-inch five-spoke Sport wheels, but as a $2100 optional extra, otherwise 18s are standard fit even on this top-spec variant. Let’s get down to the comfort side of things straight up, because this is where each of these vehicles brings a bunch of pros and cons to the table, making it difficult to choose between the two. Both cockpits look good and both are upholstered in leather – well, let me qualify that. The Beemer gets Dakota leather with perforations in Canberra Beige, while the Audi gets leather-appointed upholstery (it feels like genuine hide to me). They’re also both well-cushioned too, but the X1’s front seats lack sufficient side and seat bolster to properly hold your torso comfortably in position, even during everyday suburban driving. You can overcome the issue by ticking the optional M Sport Package, which adds a pair of superbly bolstered front seats. They really do make a huge difference to the driving experience. The Audi, on the other hand, gets standard sports seats that offer a perfect blend of bolster and body-wrapping comfort as you sink into them. Mind you, it’s a relatively low-slung chair, which is great if you value an ‘in-the-car’ driving position rather than the higher-perched seats in the X1. Both the Q2 and X1 present neat and tidy consoles, though we’d argue the BMW is the more polished of the two. Certainly, it’s got a more premium feel to it, but some of that is down to the more sumptuous beige leather, polished metal and piano black accents that feature so strongly in this cabin. We also like the X1’s floating 8.8-inch high-res infotainment screen – it’s both a touchscreen and one that is better controlled on the run via BMW’s peerless iDrive system. Pity then about the mostly analogue instrument display. That’s two traditional binnacles and not much in between, bar some basic trip data. This is where the Q2 pulls ahead of the X1, benefiting from Audi’s more contemporary and visually stunning Virtual Cockpit – a huge 12.3-inch fully digital instrument cluster that’s also configurable. Meaning, you can go from two separate binnacle-like displays to just one single tachometer with a digital speedo in the middle at just the touch of a button. The central infotainment screen looks even larger, though it’s actually slightly smaller than the unit in the BMW (8.3 v 8.8 inches). And, while Audi’s MMI Touch control panel has been slowly refined over the years, it’s still not quite as easy to use as iDrive. There are soft plastics everywhere you look and touch, but even the hard surfaces in both these SUVs look and feel premium, though the patterned red inlays in the Audi are a bit too garish for our liking. Both steering wheels are thick-rimmed leather versions complete with all the usual audio and cruise-control functionality, though the Q2 gets a flat-bottom version to BMW’s traditional circular tiller. But here’s the thing, for all the modern tech the Audi gets, there’s no push-button start as there is in the BMW – at least, not as part of the standard kit list. You can option it, though, with the Comfort Package. Seriously, come on Audi, surely this stuff should be standard fare on any range-topping model. Audi’s Q2 is a great size for city dwellers – easy to park and manoeuvre in tight spots, though neither of these two is in the least bit intimidating on the road. It’s one of the key attractions to the downsizing decision. Mind you, at 4191mm long from end to end, it’s easily the shortest vehicle in the segment measuring a leg-stretching 249mm less than the X1 we’re cross-shopping it with. Not that you’d know it from the boot space though. Pop open the electrically operated tailgate and you’ve got 405 litres behind the rear seats – 25 litres more than the Volkswagen Golf. Better still, they fold almost flat in a 60:40 split creating a virtual van-like space of 1050 litres – big enough for large boxes even. However, the rear seats need to be manually lowered – difficult to do too, as there are no levers in the cargo bay. Unfortunately, that’s where the space argument starts and finishes, because space-wise the X1 is the clear winner whether we’re talking cargo room or head and leg space. It’s got more of everything, though not unexpected given the BMW’s extra length. Those numbers read as so: 505 litres behind the second row, expanding to 1550 litres when folded in its 40:20:40 configuration (almost flat) electrically operated via buttons inside the boot. Better still, there’s a hidden storage compartment under the boot floor, revealing enough space for a bunch of stuff, including a couple of soft bags if need be. Critically, though, there’s simply not enough legroom in the Q2’s back row for anyone with long legs and a frame taller than 174cm to get halfway comfortable (tried and tested). Both vehicles get good knick-knack space too, with decent-size door bins and console boxes, though the Audi also misses out on map pockets behind the front pews. As we’ve gone for the sportiest of the litter in both camps, decent on-road performance and handling are givens. Both the Audi Q2 and BMW X1 subscribe to 2.0-litre turbocharged four-cylinder petrol engines and all-wheel drive, but understandably it’s the heavier X1 that makes more grunt. The BMW tips the scales at just under 1600kg (1595kg in this trim), while the Audi is a veritable lightweight in comparison weighing in at 1430kg, giving it a 165kg advantage. Despite the same engine displacement, the X1 makes 170kW and 350Nm of torque to the Q2’s 140kW and 320Nm, but it’s enough to scoot from 0–100km/h in a peppy 6.5 seconds – exactly the same performance claim as the BMW. However, and perhaps understandably, it’s the Audi that feels the quicker of the two. Certainly, it’s more agile given its size and weight, which also means it’s quicker off the mark, too. Rather than an eight-speed automatic transmission with paddle-shifters favoured by the X1, the Q2 uses a faster-shifting seven-speed dual-clutch gearbox for more rapid acceleration through the lower gears. The Audi feels more like a higher-riding hot hatch than any SUV, but with excellent all-round vision despite the relatively high beltline. Early twin-clutch boxes were temperamental at low speeds, often displaying a jerky character in start/stop traffic, and while much of that has been ironed out over the last few years, it’s still not as smooth or refined as the standard automatic transmission in the X1. Neither vehicle suffers from any pronounced low-down turbo lag, so both are fun to drive in their respective Sport modes, but it’s the X1 that feels gutsier in the mid-range. Obviously, it’s a very close contest in a straight-line drag race, but so too in the handling and ride departments is the competition fierce between these two petite German models. 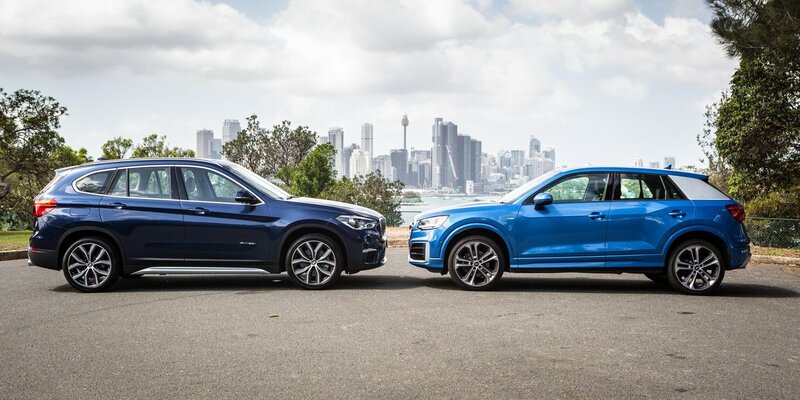 Both the Audi and the BMW can be had with adaptive dampers, but only as a $1500 option on the Q2 and $690 on the X1, if you don’t tick the M Sport Package. That said, only occasionally did we find the ride too sharp. Mostly, it rode over the bumps with a decent level of pliancy with little impact on passengers. Certainly, it’s not something we’d ever have a whinge about, but dynamic dampers can provide another level of flexibility for varying road conditions – so we’d probably tick that box regardless, but not without a haggle with the Audi sales manager. Again, the lightweight Q2 feels lighter on its feet through the corners, especially given our particular X1 was fitted with the luxury-skewed xLine trim, which adds a softer damper setting and 10mm to the ride height. As a result, there’s slightly more roll than the Q2 displays through the same bends, but the ride is suppler with more effective bump absorption. 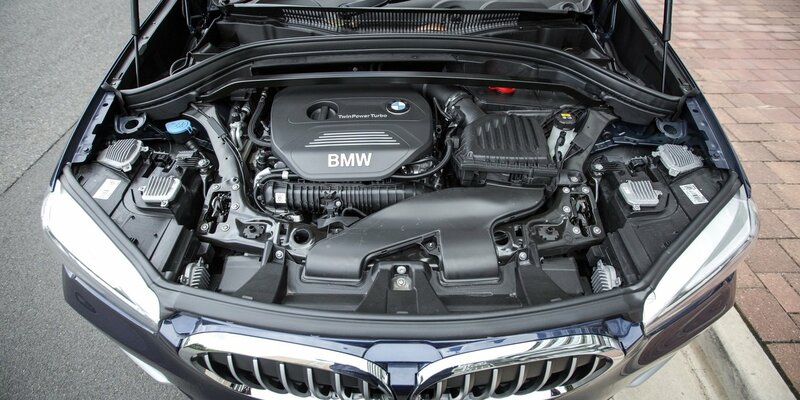 The BMW effectively counters undue lean by adding some fairly substantial bracing in the engine bay, which clearly helps to keep it composed. Don’t get me wrong, the Beemer isn’t overly soft or anything like that, you can still throw it into a corner with a good deal of confidence, though you’re obviously aware of the extra mass. You’ll enjoy driving both these SUVs more than you probably should, given their inherent agility and sure-footedness. Both are equipped with variable sports steering, though it’s the BMW that has the more communicative feedback of the two. Both vehicles get six airbags: front airbags for the front-row seats, side airbags for the row and curtain airbags for the front and rear, as well as the usual suite of active systems including ESP (Electronic Stability Program) with ABS (Anti-lock Braking System), ASR (Anti-skid Reduction) and EDL (Electronic Differential Lock). The Audi also gets pre-sense city with AEB (Autonomous Emergency Braking) and pedestrian detection. But if you want the more advanced safety kit, you’ll need to tick the optional Assistance Package ($990), which adds features like adaptive cruise control with Stop&Go function including pre-sense front, lane assist, side assist, and high-beam assist (automatically switches between high and low beam). You also get hill-hold assist, park assist that can effectively steer the vehicle into a tight spot with the driver working the throttle and brake only, and a rollover sensor. The BMW offers a larger suite of safety kit as standard, such as cruise control with braking function, Driving Assistant that includes speed limit info, lane departure and forward collision warning, along with Parking Assistant that, like the Audi, will help drivers park their car in tight spots. Also standard on the X1 is automatic anti-dazzle function on the driver’s side exterior mirror as well as the rear-vision mirror – both extremely useful at times. 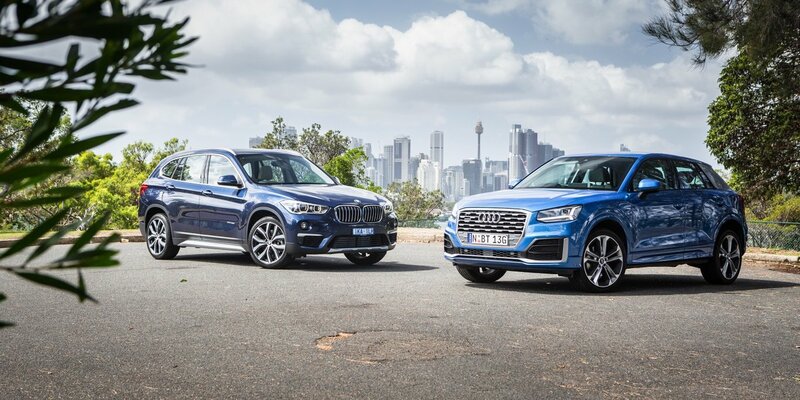 Their smaller proportions already dictate a built-in frugality, and both the Q2 and X1 claim almost matching fuel consumption: 6.5L/100km for the Audi and 6.6L/100km for the BMW. But, the fact is, these two models also have an inherently sporty side to them, and if you’re anything like me, you tend to enjoy those attributes perhaps a little too much – meaning you generally won’t meet those factory claims. That said, the Audi’s lighter chassis means it’s by far the most economical proposition, at least in the real world, with regular readings indicating average consumption under 9.7L/100km, whereas the BMW used far more of the premium stuff with regular readings of up to 14.8L/100km and rarely below 11.8L/100km. Audi’s service plan pricing for the Q2 covers three years of scheduled servicing or 45,000km (whichever comes first) regardless of diesel or petrol engines and costs $1590. BMW applies a different strategy, offering multiple terms and distances from three years and 100,000km up to 10 years and 200,000km. BMW also provides a Service Inclusive schedule over five years/80,000km package pricing, which for the X1 varies from $1340 for the Basic plan, or $4050 if you choose the Plus edition, which adds stuff like replacing the front and rear brake discs and pads, wiper blade rubbers and clutch disc and plate. Downsizing from a medium-sized SUV to a smaller model makes a lot of sense for many reasons, especially if you’re like us and only have one kid at home these days or live in one of those densely populated inner-city ’burbs. It makes even more sense in the premium segment, where the difference in the price can be as much as 30–40 grand. They’re also significantly cheaper to run and inherently easier to live with. But, best of all, you don’t have to go without creature comforts you’re now so used to. The pint-size Audi Q2 makes the most sense in this regard, with decent luggage space, contemporary styling (inside and out) and warm-hatch status in the performance department. Seems like a winner, right? Not if you’re like us, with a 16-year-old that’s too tall to find any semblance of comfort in the second-row seating – that’s the tipping point in this exercise, which effectively rules out the Audi, at least for our family. Pity, because apart from rear legroom, it covers all our immediate requirements for a city-based, family crossover that’s also fun to drive. Thankfully, though, BMW got the styling pretty much right on its second-generation X1, because its gen-one attempt was simply hideous. It’s got a more masculine look and stance, but we wouldn’t exactly say it’s handsome or chic in the same way the Q2 is. The Beemer also feels decidedly premium against the Audi, but that says more about the chosen trim in the Q2 than the fit and finish of the materials in our particular test model. Still, the X1 is also fun to drive with good dynamics and a comfortable ride, but importantly it has the extra space that many families would require of their family chariot. In this case, the win goes to the BMW, but it’s a compromise until we spend some quality time in the all-new X2, which has both the space and the styling to turn a few heads – perhaps even ours.